While no one wants mold growing in their home, sometimes, the sneaky fungi makes its home in places you don’t often check. In addition to the common mold sites like bathrooms and below kitchen sinks, mold can also form in your HVAC system due to the moisture that builds up. 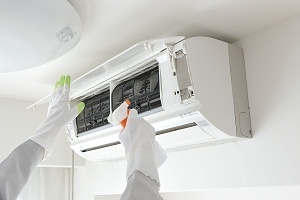 Mold prevention strategies, having your system checked periodically so a mold colony doesn’t form unchecked, and learning about what makes mold grow are smart ways to keep your home mold-free. Read on to learn more about mold prevention and how it applies to your heating and air conditioning in Roswell, GA. According to the CDC, exposure to mold can cause a variety of health complications. Depending on a person’s sensitivity to mold, these complications can include more minor symptoms like nasal congestion, throat irritation, coughing, eye irritation, skin irritation, and other allergy-like symptoms. People with mold allergies, lung illnesses, or compromised immune systems, may develop more serious infections of the respiratory system. Rather than taking chances with your health and the health of your family, preventing cases of mold is a much safer and healthier route. In addition to causing complications with your health, mold can also cause expensive damage in your home. Replacing flooring, ceilings, walls, furniture, machinery, and more can add up to a huge sum of money, since sometimes, mold clean-up is effective and sometimes full replacements are necessary. When it comes to your HVAC system, it is a perfect environment for mold to grow due to the high moisture levels, which is doubly problematic. It can cause damage to your system, and it also distributes that mold around your home when your AC blows into the house. Frequently replacing filters is a great way to minimize mold growth. 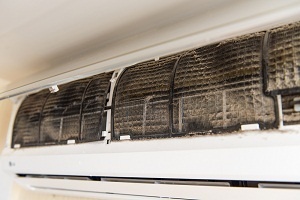 These annual changes help ensure that the moist filters don’t become a home for mold. You can also use an industrial vacuum to remove water and moisture buildup from inside your unit. Since moisture is essential for mold growth, keeping moisture levels down is the best way to prevent it. A mold inhibitor specifically designed for your air conditioning in Roswell, GA, is another great way to nip mold problems in the bud. You can also use disinfectant to kill any mold growth, and it will also help to prevent future growth. Remember, however, that since you may be breathing in anything that goes into your HVAC system, it's important to choose something labeled by the EPA and designed for this exact purpose.